Esta encantadora casa de dois níveis, com a sua luz e arejado atmosfera, oferece um ambiente descontraído e aconchegante em cima da ensolarada Park Hill. Moonstone Beach, Shamel Park & ​​o Fiscalini Ranch Preserve estão todos dentro de uma curta distância. A casa em si oferece uma sala de estar / jantar grande e confortável, com tectos inclinados, muitas janelas e um gás livre lareira de pé. Existem 2 quartos espaçosos com camas queen size e 2 banheiros. Além disso, há uma área de sala de estar / loft localizado fora do quarto principal que tem seu próprio deck com vista para a bonita área de quintal. Cozinha totalmente equipada com microondas e máquina de lavar louça tem tudo que você precisa para aqueles momentos em que você prefere refeições. Equipado com TV / VCR / DVD e televisão por satélite, CD / Tape / Rádio leitor / Stereo, bem como internet banda larga sem fio. Esta casa também dispõe de um jardim privado, três decks, garagem, carvão para churrasco Weber e uma lavadora / secadora. Pelican Cottage é um retiro tranquilo que lhe permitirá apreciar a beleza de Cambria. Andar na praia, passear ao longo da trilha bluff e ver a vida selvagem local ou desfrutar da tranquilidade do seu entorno imediato na própria casa. Também é fácil pegar o local 'Otter Trolley' na vila de Cambria para fazer compras, jantar ou apenas começando a conhecer a nossa bela comunidade costeira. Hearst Castle fica a 15 minutos de carro da casa, bem como o selo de elefante Visualizando áreas que são muito popular para os visitantes, bem como residentes locais. Desfrutar de amostragem alguns dos premiados vinhos locais situados nas imediações na Robles Wine Region Paso ou explorar as outras cidades costeiras de Cayucos e Morro Bay. Há algo para todos aqui na Costa Central ... esperamos que você visite em breve! A casa está localizada perto de Moonstone Beach e é um fácil 10 a 15 minutos a pé para chegar. A próxima rua é Huntington Road & tem uma entrada para o Fiscalini Ranch Preserve o que é uma área popular para caminhadas. I needed a get-a-way This home provides it. The house is so nicely done and has everything you need for cooking or BBQ. The bedrooms are bright you have lots of room and very comfortable, I slept very well and I don't usually, but here I had no problem with a good nights sleep. The living room and dining room are sunny and bright and the fire place keeps you warm and cozy in the cold evening. This house is a gem!! This might be my favorite house rental ever.. My wife and I have stayed in Cambria probably 30 times over the years and this house is a gem.. Washer/Dryer.. Frontroom stove/fireplace that heats the room up quickly..Kitchen with everything you would need etc..very very clean.. will be back and we will check out this property first before looking elsewhere..Thanks for a great stay!! 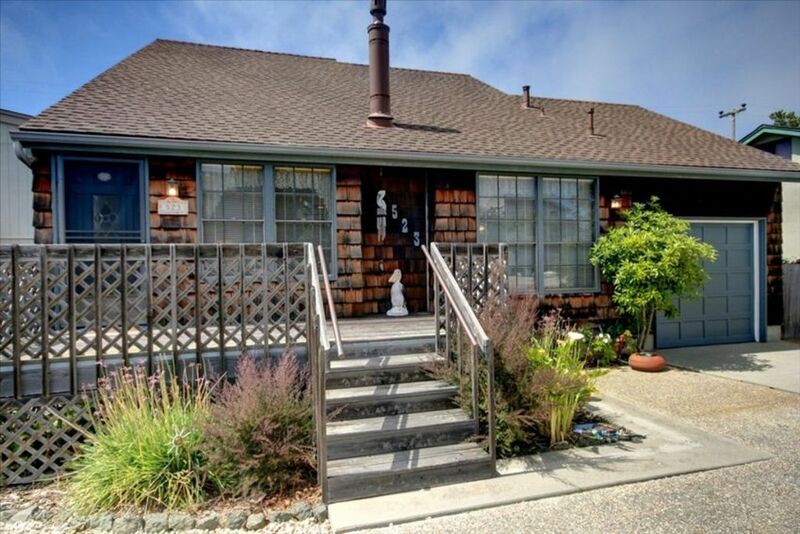 Pelican Cottage is indeed a charming place to stay. We would return! The cottage is clean and well stocked. We had some issues with a kitchen light that is slow to illuminate but it works! We would return. This was a beautiful home! Very comfortable. Beds are very comfortable. Close to beaches, shopping and restaurants. Loved the home and space it had. Small kitchen but very workable and gas everything you need. I would definitely stay here again!!! The cottage was neat, clean, comfortable and cozy! It was just the right size for 2 of us. Linens provided were fresh. The kitchen equipment was all we needed for the bit of cooking we did. We were able to walk to the Bluff & Moonstone boardwalks. The days were clear, cool and sunny. Great cottage in a quiet neighborhood. Loved our week at Pelican Cottage. PLEASE NOTE: Rates are based on # of guests: 1-2:$150 per night, 3 or 4 guests $25 per person extra per night. 3 night minimum always required, but during dates 6/15-9/30, 5 night stays will apply. Federal Holiday weekends are a minimum of 3 to 4 nights nights, however Easter/Spring Break, Thanksgiving, Xmas & New Years weeks will be a minimum stay of 5 nights. **For requests fewer than the minimums please contact me but please note that we are not allowed to rent for only 1 night. ** Adults preferred. ADDITIONAL CHARGES: Cleaning Fees: Based on # of guests & length of stay + Res.Fee $25 + 12% occupancy tax on total. CANCELLATION POLICY:There is a $100 fee for any cancelled reservation. If you cancel a reservation a minimum 61 day notice must be given for an immediate return of your deposit. If less than a 61 day notice is given, there will be no return of deposit or any collected funds unless the home is re-rented. No refunds will be given for early departure or fewer guests after home is occupied. Arrival & Departure: Check-in is 3pm & check-out is 11:00am. Your keys will be in a lockbox at the front door of the home. You will be given the lockbox code prior to your arrival date, or we will meet you at the property.